This UK release is a remixed "Radio Edit" (3:21) of "Nothing Is Keeping You Here" and was available for download from itunes, but is not available in the shops. The download includes the "Radio Edit" and "Album Version". The single was released in Germany on 20 November 2009 and features a different "Single Edit" (3:04) in addition to the radio edit which is listed as "Steve Osborne Remix". The cover art of the German release features a shot of trees in a wood with green grass below. There are some abstract arty 'leaves' across the trees in the style of the album artwork. A large white a-ha logo has been printed across the middle of the sleeve with the title in smaller white letters below. The reverse of the insert has a picture of more of the trees in the forest with track information in white. There is a green and white sticker on the front of the case with the text "brand new single from the No.1 album Foot Of The Mountain 2726819". The disc is white with large black a-ha logo and abstract art pattern. The one track UK promo comes in a PVC wallet with a colour paper insert. 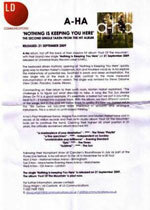 The reverse of the insert has A-HA and 'Nothing Is Keeping You Here' 3:20 printed in black letters. The Record Label information is printed below with a unique single number (e.g. single 306) at the bottom. The disc is silver with black text. There is a slightly different version of the UK promo which, instead of having text printed on the disc, it has a white label with black text. The insert which comes with it is similar to the other promo version. Some copies come with an A4 press release information sheet. There is a one track German promo single which comes with a white paper insert with the track information printed in black. The CD is silver with black text. The promo features the "Single Edit". The Netherlands? : There is a 1 track promo featuring the album version of "Nothing Is Keeping You Here" (3:17) which comes in a clear wallet without insert. The disc has a white vinyl label with the title in black at the top, Universal logo on the left hand side and the text: ALBUM: "foot of the mountain" OUT NOW! at the bottom. There is no catalogue number or indication of where the disc is from, but it is thought to be Dutch.